Fleece is a very popular fabric for clothing for elimination communication, due to the water-repellent qualities of fleece. 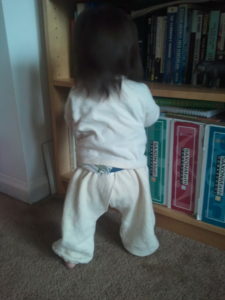 A fleece diaper belt or EC pants can be reused through many wet diaper changes before needing to be washed. Fleece is made of 100% polyester. It is a synthetic fabric, and is sometimes an eco-friendly fabric by being made out of recycled materials. The benefits of using fleece include that they are very easy to wash and dry in regular washing machines with the rest of your laundry. Fleece repels liquids, which makes it a great choice for split pants. 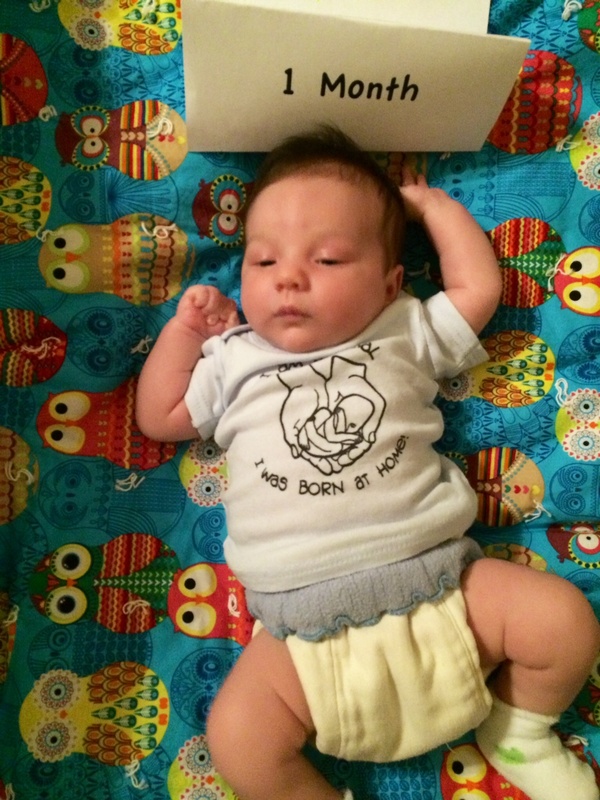 Even during a miss, your baby’s clothes will stay dry. These EC pants are perfect for wearing under a diaper or tucking a prefold diaper into them– like a diaper belt with legs! During especially cold weather, layer with a pair of legwarmers or long socks underneath L’il Baby Chaps™ and you are ready for the snow. Perfect for EC or cloth diapering, L’il Baby Chaps can be worn with a diaper under or over. This saves time at every diaper change or potty visit as you won’t have to remove layers of clothes. L’il Baby Chaps are especially useful with a mobile baby or toddler who does not want to lay still for diaper changes. L’il Baby Chaps can be worn with a prefold diaper tucked in to the waistband or with a fitted diaper on top. You can also use a diaper cover on top if you want. Sorry- fleece L’il Baby Chaps are sold out. 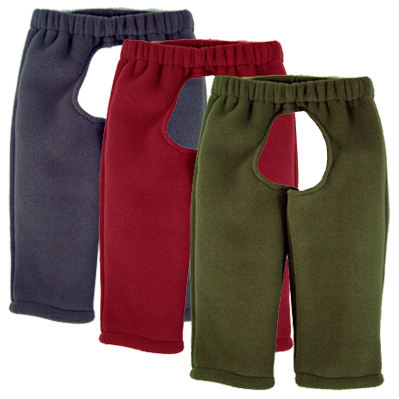 EC Wear Split Pants™ in fleece can be used with cloth diaper underneath, and the design covers more of the diaper than other styles of split pants, and the fleece acts like a fleece cloth diaper cover, giving water repellency and absorption. Sorry- fleece EC Wear Split Pants are sold out. Fleece’s water repellent properties and easy-washabiliy make it a great choice for diaper belts. Fleece fabric is available in a wide variety of colors and is easy to machine wash and dry. A fleece rECtangle Cover™ is a simple yet clever cloth diapering solution that makes EC simple and easy. Fleece provides a water-repellent yet absorbent layer on top of a cloth diaper, which can be used to coordinate with split pants, and is easy to machine wash and dry. Sorry- fleece rECtangles™ are sold out.